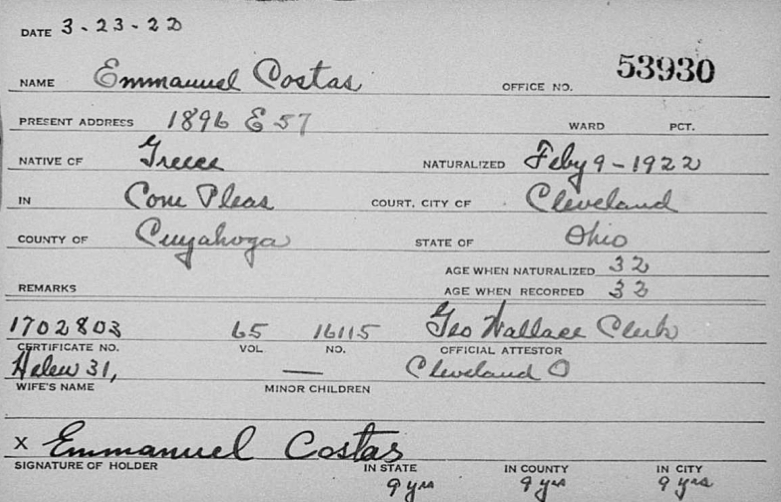 The FamilySearch.org website offers FREE access to their database - Ohio, County Naturalization Records, 1800-1977. There are 4,576 people in the database who have listed Greece as their place of birth. You will be able to view records on each individual as pictured above. The collection consists of images of naturalization records from county courthouses in Ohio for the years 1800 to 1977. The record content and time period varies by county. Some counties have indexes that cover years later than 1954. Naturalization is the process of granting citizenship privileges and responsibilities to foreign-born residents. The first naturalization act was passed in 1802. Immigrants to the United States were not required to apply for citizenship. Of those who did apply, many did not complete the requirements for citizenship. Naturalization to become a U.S. citizen was a two-part process: the Declaration of Intent to Naturalize, or First Papers, and the Naturalization Record (including the Naturalization Petition), or Final Papers. The First Papers were normally filed five years before the Final Papers because of the five-year residency requirement to become a citizen. No centralized files existed before 1906. In 1906 federal forms replaced the various formats that had been used by the various courts. Copies were sent to the Immigration and Naturalization Service (INS), creating a central file for naturalization papers. The INS is now known as the U.S. Citizenship and Immigration Services (USCIS). Naturalization records are generally well preserved, but some records may have been lost to fire or other disasters. The information that was current at the time of naturalization was usually reliable. However, there was always a chance for misinformation. Errors may have occurred because of the informant’s lack of knowledge or because of transcription errors or other circumstances. The information found in Naturalization Records vaires by county and individual record.